How much do you really know about podcasting? Take the quiz and find out! Who won the 2013 podcast award for science? How many primary podcast categories does iTunes have? What company invented the mp3 technology? Who is the author of the RSS format? In what year did the first portable MP3 players appear? 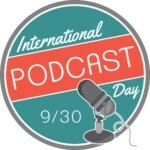 The term Podcasting was first mentioned by who? Who was the first U.S. President to Podcast? In 2005 Apple introduced Podcasts into which version of iTunes? Share with friends to take the quiz.